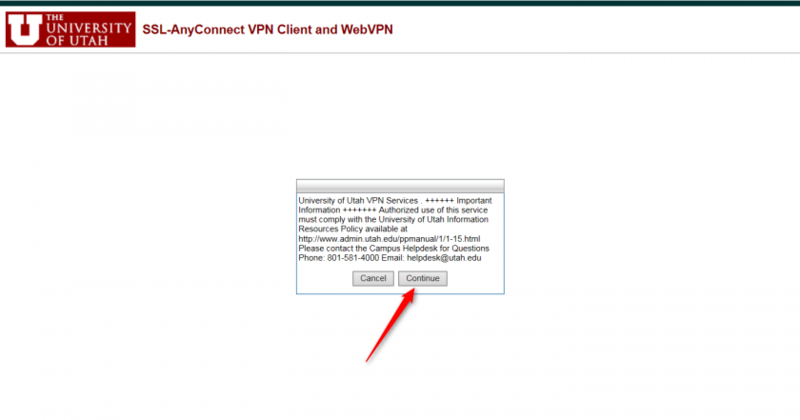 The U of U Campus VPN (Virtual Private Network) is used to access your on campus network resources when you are located off campus (G/H drives, Trouble ticket, etc). The VPN CoN uses is called Cisco AnyConnect. 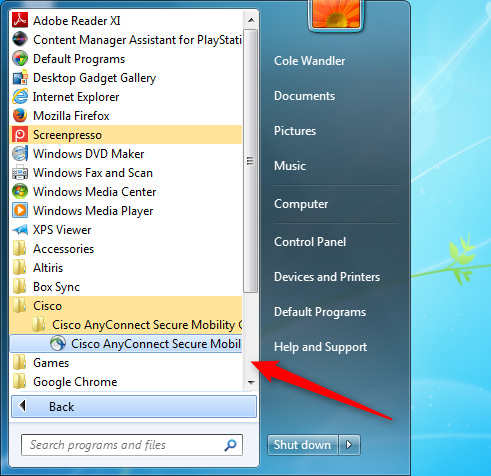 If Cisco Anyconnect isn’t installed on your PC follow the directions below to install it and get connected. 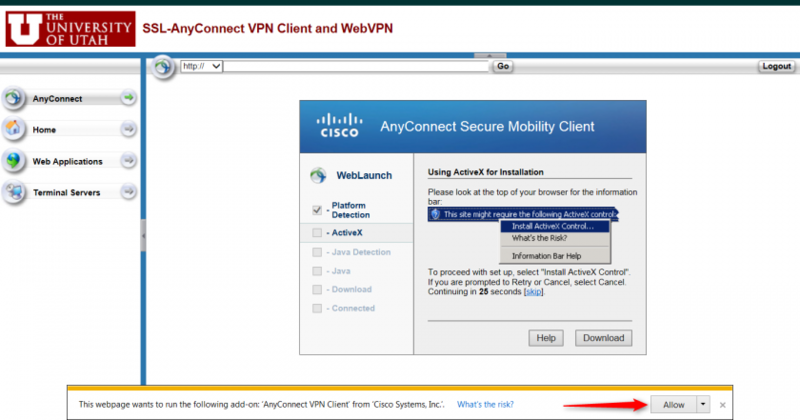 If you already have the Cisco AnyConnect VPN installed click here to skip to Step 8 for getting connected. You will need a stable internet connection. 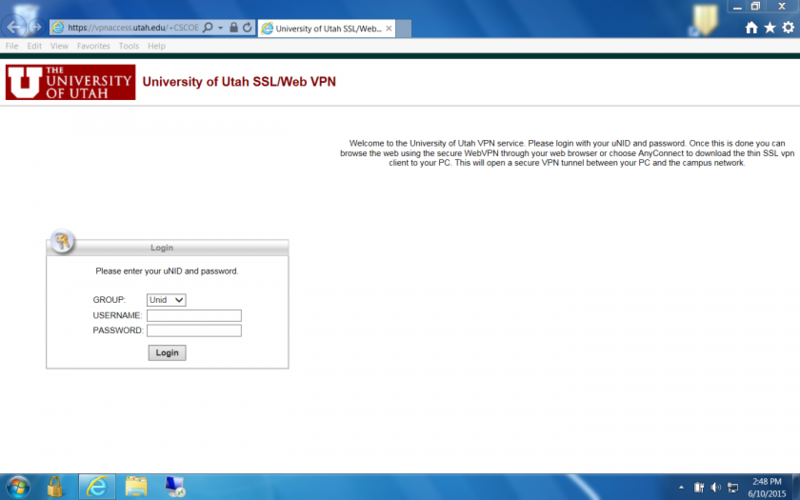 Open a web browser and navigate to: https://vpnaccess.utah.edu and login with your uid and password. Click Continue on the next screen. If you are using a different browser and AnyConnect doesn't automatically install, you will have the option to download the application from a different link. Click on the link to download it. 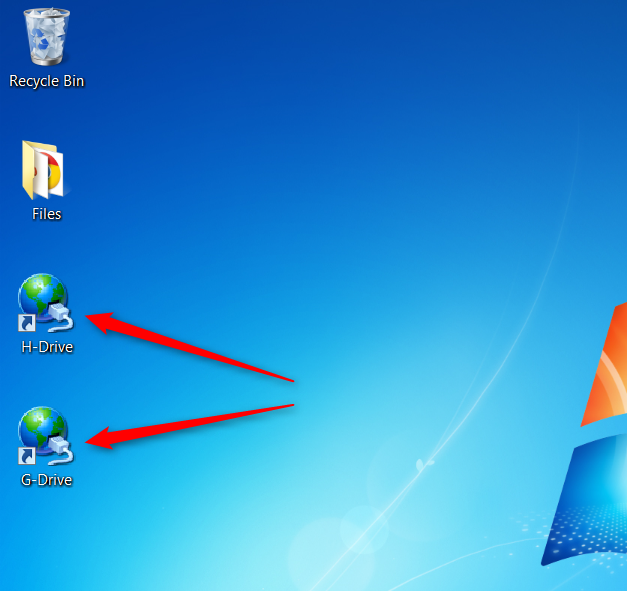 Once downloaded run the file if you haven't already, then follow the instructions on the Setup Wizard to install it to your PC. 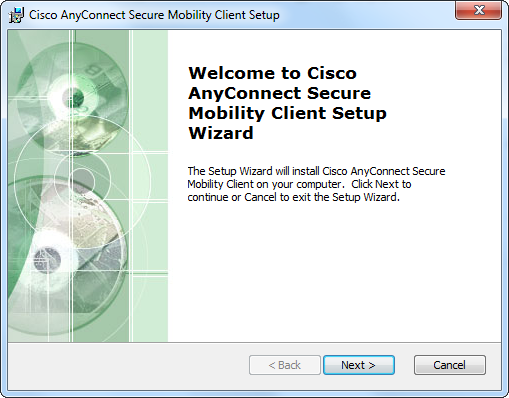 Once Installed you can find the VPN application by navigating to: click the Start button, click All Programs, click Cisco, then run the Application called Cisco AnyConnect Secure Mobile Client. After you run it, you will see a dialog box appear (usually in the lower right corner of your screen. 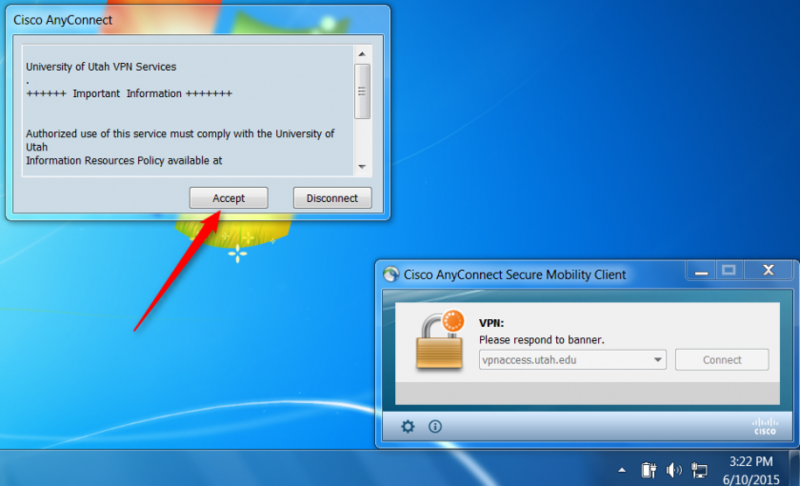 Make sure the dialog box reads vpnaccess.utah.edu in the dialog box if it has a different address clear it and type in vpnaccess.utah.edu, then click Connect. While connecting, another dialog box will appear next to the first dialog box, asking you to log in with your uid and password. 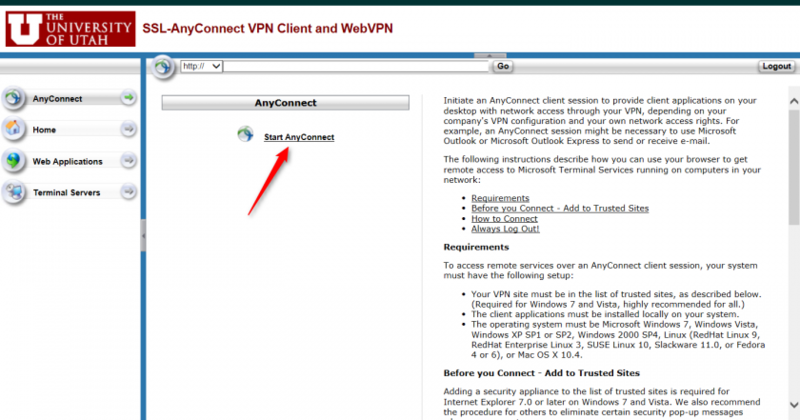 Enter your uid and password and click OK.
After that, while connecting, a banner containing information about the VPN will appear. Click Accept to continue connecting. Once connected, you will see a green check mark indicating that you are connected. 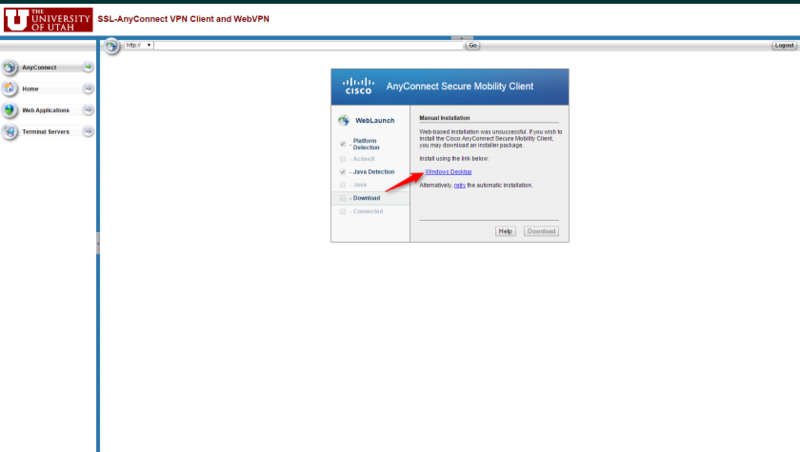 You can also check your connection status of the VPN by clicking on the up arrow in the bottom right corner of your screen and then double clicking on the Cisco AnyConnect icon. 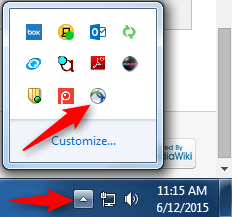 After you have successfully connected to the VPN, navigate to your desktop. A black window should appear that is connecting you to your network drive. 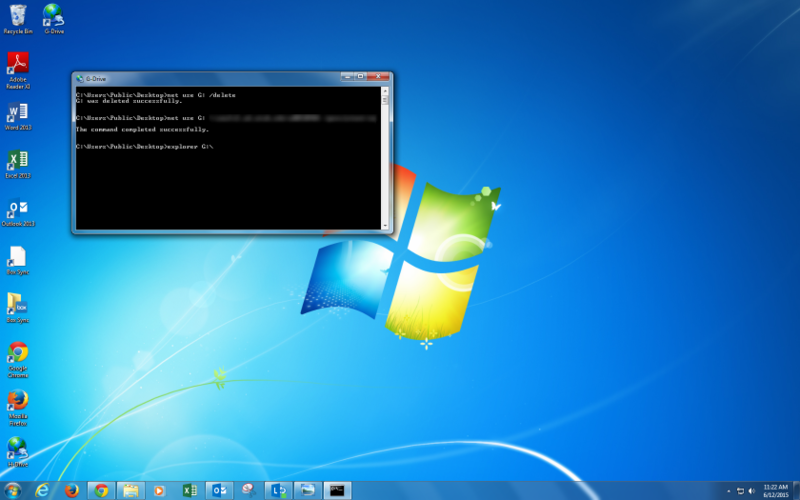 When the black window disappears you should now see the network drive. If you do not see your network drive please double check that you are successfully connect to the VPN. For help troubleshooting call 801-587-6000 and tell them you need help installing the campus VPN that uses vpnaccess.utah.edu for the connection address. This page was last modified on 16 June 2015, at 11:01.